The GMC Terrain is just a macho-er looking version of Chevrolet’s roomy Equinox. What do you need to know before you buy a GMC Terrain? Don’t worry, we’ll tell you everything right here in our Buyer’s Guide. The Chevrolet Equinox is GM’s fuel efficient, small CUV. Except that it isn’t really all that small. General Motor’s GMC brand decided to build a tougher looking version and sell it for a few grand more. That vehicle is called the GMC Terrain. GM’s Theta platform has graced us with vehicles like the Saturn Vue, the Pontiac Torrent, the Saab 9-4X, and even the Suzuki XL7. Okay, so maybe these car’s don’t necessarily make you think “high quality,” but the platform is actually pretty good. Ride quality is decent, safety marks are high, and because the underpinning has been around for so long, most of the design quirks have been worked out, meaning you won’t be spending all of your time at the shop. One of the major pluses of the Terrain is its size. It’s over 185 inches long and has a massive 112.5 inch wheelbase — both huge dimensions for the segment. As a result, second row seating feels downright cavernous, especially with that rear bench slid all the way back. Plus, gas mileage isn’t bad, either. 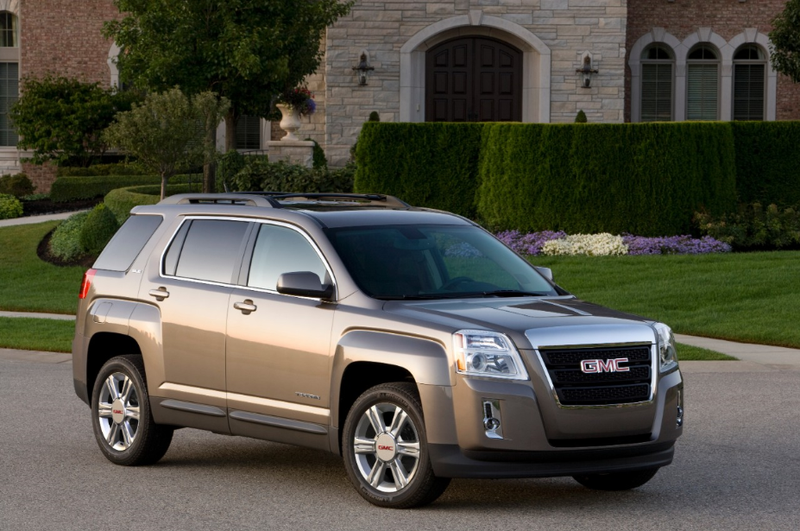 The first generation GMC Terrain launched in 2010 with a 3.0-liter V6 and a 2.0-liter Ecotec inline 4. Since then, the 3.0-liter has been replaced by a more powerful, more efficient direct-injected 3.6-liter V6, some new safety gadgets have been introduced, and the in-car communication system has been freshened up. But otherwise, the 2015 Terrain isn’t much different from the car that launched five years ago. The Terrain comes in a bunch of different varieties: SL, SLE-1, SLE-2, SLT-1, and SLT-2. If we were looking for a larger crossover with good fuel economy, we’d probably just get the L model Chevrolet Equinox and forego the GMC entirely.